Across the Pacific, the US Navy’s desire to buy 52 variants littoral combat ships (LCS) appears to be shelved. Secretary of Defense, Ash Carter, directed the Navy to cap its buy at 40 ships  and pick only one supplier from the two competing firms. He also told the Navy to buy only one ship a year over the next four years, down from three per year. Carter plans to use the savings to fund other Navy programs  such as the purchase of missiles and aircraft. At the same time, however, Carter allocated an extra US$1.7 billion to the Navy budget over the next five years. 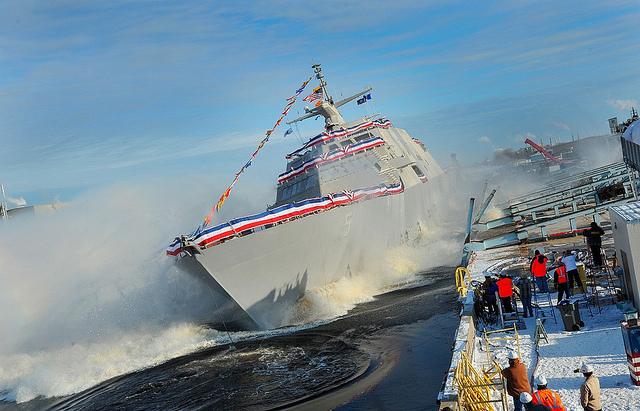 Meanwhile, a week after the US Navy’s brand new littoral combat ship, LCS Milwaukee, broke down at sea, engineers and experts are still trying to determine  why metal debris fouled the ship’s propulsion system. The repairs to Milwaukee are likely to take weeks according to US officials, because identifying those kinds of problems  requires flushing out the vessel’s propulsion system and taking it apart. Last week, the BBC revealed a Royal Australian Air Force (RAAF) plane had conducted a maritime patrol over the South China Sea. Australian Defence Minister, Marise Payne, confirmed the routine maritime flight had taken place as part of RAAF Operation Gateway (in effect since 1981) and that the RAAF will continue to conduct surveillance flights  in the region consistent with international law. Benjamin Herscovitch takes a look at Australia’s shaky South China Sea strategy  over at the AIIA’s Australian Outlook, arguing that freedom of navigation operations are actually an ineffective response to China’s actions in the South China Sea. Boeing and Lockheed-Martin have filed a protest with the US Government Accountability Office in support of their argument that the US Air Force’s decision to award the contract for the Long Range Strike-Bomber to Northrop Grumman is ‘fundamentally flawed.’ Breaking Defense takes a quick look at the saga here . Northrup Grumman has responded that they won the contract after a thorough selection process and that the protest filed by Boeing has no merit . The US Congressional Research Service has released a new report titled ‘The Air Force Aviation Investment Challenge.’ The report looks at the funding crunch the US Air Force will face in the next few years between its F-35 and tanker programs, the launch of the Long Range Strike Bomber program, and the continued need for drones and C-130s. The report, which can be viewed here , recommends possible courses of action for the Air Force. Ash Carter has officially confirmed US Special Operations forces are active in Northern Syria. Paul McLeary over at Foreign Policy takes a look at Carter’s announcement and what it means to have boots on the ground . Carter has said that, so far, the commandos’ mission has been successful  in identifying local Syrian Arab forces willing to fight Daesh with US assistance. Meanwhile in Washington, Lockheed Martin is about to take the US Government to court over a contract that it lost to replace US Army Humvees. US competitor Oshkosh beat both AM General and Lockheed for the contract  to build 16,901 vehicles on a contract worth up to $30 billion. Upon losing the contract, Lockheed filed an administrative protest with the Government Accountability Office (GAO), but the company has now announced its desire to escalate to legal action over the matter amid claims  that documents relevant to the case weren’t released until the final stages of the GAO hearing. Listen: in the wake of the news that Daesh fighters fear being killed by the female fighters  in the Syria-Kurdish Women’s Protection Unit because they believe they won’t go to heaven, a new podcast  from War is Boring takes a look at the role that those female fighters, and other women, are playing in the war against the Islamic State. Alice Slevison and Mercedes Page are research interns at ASPI. Image courtesy of Flickr user Naval Surface Warriors.